On a rare Wednesday night Pac-12 matchup, Oregon (14-9, 5-5) took on the lowly Cal Golden Bears (5-17, 0-10) in a potential trap game for the Ducks. Cal has been the laughing stock of the Pac-12 (as if the whole conference isn’t ripe for derision) as they entered the game on a 10-game losing streak and have yet to win a game against Pac-12 opponents. Cal’s Achilles heel has been its defense, which allows 79.5 points per game, good for 334th in the country out of 351 teams. Oregon really struggled in Colorado to come out of the gates, but on Wednesday the Ducks hit 6-12 threes against the Golden Bears' 2-3 zone and went on a 17-2 run over a 5-minute stretch in the first half. Oregon did struggle with turnovers at first, and Cal was able to keep the game close until that 17-2 run. During that run, it became clear just how bad this Cal defense really was. Kenny Wooten came to play in the first half, finishing with 4 points, 5 rebounds, 3 blocks and 2 steals and injecting some energy into his team. Wooten also had the highlight of the half – and probably the game -- when he blocked a layup attempt with two hands, ran down the court and flew high above the rim to grab the Victor Bailey's missed jumper and slam it down over a Cal defender. A sensational play from the high-flying sophomore. Another first-half star was Payton Pritchard, who hit 3-6 three pointers and led the team in scoring with 9 points and 7 rebounds. The second half continued the Pritchard and Wooten show, as the two combined for 18 points after intermission. Pritchard was much more aggressive and was not afraid to attack the rim or take the open jumper. It was very reminiscent of the Pritchard of old, and we’ll look to see if his rebirth continues. Oregon shot the lights out in the second half, finishing the half on a 65.4 percent clip and hitting 5 threes on 42 percent shooting. 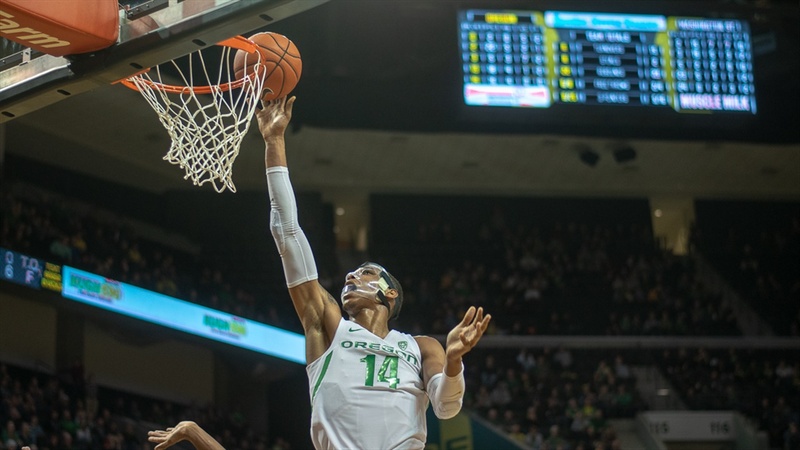 The Ducks really took advantage of the lackadaisical defense displayed by the Golden Bears, but were unable to go on an extended run like they did in the first half. Cal was 5-8 from downtown in the second half and got to the line 13 times, converting 12. Oregon also struggled with turnovers all night long, committing 15. Cal capitalized on those turnovers, scoring 22 points – and that was what kept the Golden Bears in the game. Cal would keep it interesting enough to the point where you couldn’t really tell if the Ducks were going to pull this game off, given their recent late-game problems. But the Ducks continued to wear out the Cal defense, and every time it got close Oregon would score two quick baskets and the game would look closer to being over. The Ducks never wavered, and they were able to close the game out with free throws and easy layups. A solid win for Oregon in what easily could have been a trap game. Pritchard finished with 20 points and 10 rebounds, his second career double-double. Pritchard also finished 5-9 from the three-point line. Wooten finished with 11 points, 5 rebounds and 4 blocks. He has looked a lot better these last three games, which is a great sign as he continues to recover from his broken jaw. Will Richardson had 8 points and a career high 9 assists -- another great game at the point guard position. Lou King wasn’t as stellar as he’s been, but 12 points, 2 rebounds, 2 assists and a team high +17 plus/minus will certainly do. Oregon finished with 5 free throws, 14 fewer than Cal, in a game where three-point shooting was all the rage. Oregon was 11-29 from behind the arc, good for 39 percent, and as a team it shot more than 55 percent from the field. Oregon won the rebounding battle 33-23, including limiting Cal to just 4 offensive rebounds.